John Franklin III -- one of the stars of the first season of the Netflix hit Last Chance U -- will transfer from Auburn to Florida Atlantic after one year on the Plains, according to a statement posted on his Instagram account. "Thank you for loving me and accepting me into the family," Franklin wrote. "I will forever be grateful for the opportunity to be a player for this great university. In life, your happiness is all you have control over and I am making a personal decision to leave Auburn and go home and continue to make my dreams come true." The former dual-threat quarterback, who began his career at Florida State before moving to East Mississippi Community College and starring in the show, made the switch from backup quarterback to wide receiver this spring at Auburn. "John Franklin came to me expressing his desire for the chance to play more and get closer to home," Auburn coach Gus Malzahn said in a statement. "He has made the decision to play elsewhere this season as a graduate transfer. John has been an outstanding young man during his time here and leaves Auburn with a degree. We wish John nothing but the best and thank him for his time at Auburn." Franklin passed for 204 yards and a touchdown and rushed for 430 yards and two touchdowns for the Tigers in 2016, serving primarily as a backup and changeup quarterback behind then-starter Sean White. With Eli Stove and Ryan Davis already entrenched as slot weapons in the Tigers offense, Franklin would have had as much difficulty cracking the playing rotation at wide receiver as he would have at quarterback. A native of Fort Lauderdale, Franklin will be eligible to play immediately as a senior at FAU -- his fourth school in four years. 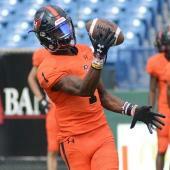 Once he arrives, he'll join former East Mississippi Community College and Florida State quarterback De'Andre Johnson -- who was the star of the second season of Last Chance U. Not to be outdone, Kiffin reportedly nabbed the quarterback of the future when former Oklahoma signal-caller and 4-star prospect Chris Robison announced his intent to transfer to the program as well, according to a screenshot of a message on his protected Twitter account captured by Bob Przybylo of Sooners Illustrated. Robison was dismissed from the Oklahoma program earlier this month for violation of team rules. The pro-style prospect from Mesquite, Texas enrolled at Oklahoma in January and will have to sit out the 2017 season. Kiffin, perhaps not coincidentally, seemed to be in a good mood on Twitter. Franklin and Robison will join Johnson, former Florida State linebacker Kain Daub and former Pitt defensive lineman Jeremiah Taleni on FAU's roster in what Kiffin appears to be shaping into an FBS version of Last Chance U.